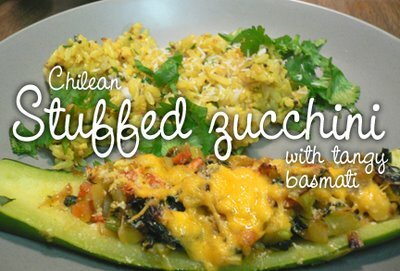 My mother makes these delicious little baked zucchini boats and calls them "zapallitos italianos", which means Italian squash, but it's Chilean to me! The tangy basmati, which was contributed by fellow Recipe Clubber Marion, is also a great accompaniment to any bake, stew or curry. Bring a pot of water to boil and cook whole zucchini until just tender, about 20 minutes. Meanwhile, prepare vegetables: finely chop leeks, dice the carrots, mince the garlic, dice the red pepper, and wash and coarsely chop the spinach. (Red pepper and spinach are optional depending on what you feel like, it almost doesn't matter what vegetables you use for the stuffing, it's all good! Want to use some diced sweet potato? Or kale? Go ahead!) Heat up a wok or pan and add oil. When ready, add leeks, garlic, carrot and pepper if using. Saute for several minutes until golden and aromatic. Season with salt and pepper. Set aside momentarily. Remove zucchinis from pot when they're ready and cut in half lengthwise. Scoop out the flesh, chop it up and add to the vegetable mixture. At this point also add spinach if using. Saute a few minutes until excess liquids evapourate and flavours blend. Now divide this vegetable mixture among the 4 zucchini boats and top with either bread crumbs, parmesan, or grated cheese. A dusting of paprika always looks nice, too. Bake at 350 for about 10 minutes until edges turn golden. Prepare rice as always: rinse well, then place in a pot with 1 3/4 cups water, bring to a boil, then simmer on low, covered, until cooked (20 minutes for white and 40 for brown). Best to prepare this before the rest of the meal! In a small pan, heat up oil and add mustard seeds, turmeric, coriander seeds and nuts. When seeds begin to pop, add coconut and stir well to toast and blend spices. Set aside until rice is ready, at which point stir into rice with lemon juice and chopped cilantro. I made the stuffed zucchini - it came delicious. I added gluten free bread crumbs and grated cheese on top before baking.